Before creating a garden we should consider several things, such as planning and shape of the park, maintenance and aesthetics. For what the park should also be made clear and focused, good only to enjoy its beauty or there is another element. Usually the beauty of the main goal, while other elements such as ecology, religion, the social support element. However, lifestyle changes from time to time continue to create trend towards the objective of making the home garden. In the first era, making the park a lot designated as a place to socialize. It can be noted from the extent of the page, soft material consisting of trees and shrubs in limited quantities. The rigors of the elements consists of gravel is spread evenly on the track serves as a road. On the right side or left side of the field are given free space that is not filled by hard and soft materials. The empty space serves as a children's playground. The empty space is more dominant than the soft and hard elements. In ancient times, the need for gathering is the main thing. Community activities in ancient times among the children playing in the park field house, mothers huddle together on the porch, men gathered in front of the house to discuss village issues and so on. The concept of the park any house look spacious, provides some shade trees plus gravel elements into a balanced composition by lifestyle at that time. Some Kind of hard elements known at that time was limited. Gravel most easily found, followed by a concrete wall and a barrier of rocks. Creator beautiful gardens of those who passed motivated by the need to socialize. Now it's very different. Material needs more dominant than social needs. Indeed, the time owned by "now" very limited due to busy daily activities. From here it was finally seen, that their lifestyle greatly influenced the style of garden design at home. They tend to want peace and calm in their lives. As a result, the house design style was chosen to match, which is close to nature. 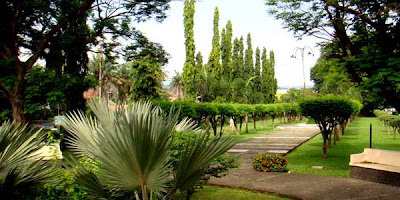 Therefore, we will often find creative home gardens today are dominated by various kinds of trees and natural rocks.